Being successful in real estate goes beyond the sale transaction. It’s about building relationships with your community and ensuring that you are portraying a positive energy and image. Branding yourself is part of your business and the better you brand yourself; the better it will be for your business. It also takes being able to make investments into your community’s future. Marketing plays a key part of being successful and of spreading your name throughout the neighbourhoods you wish to service. 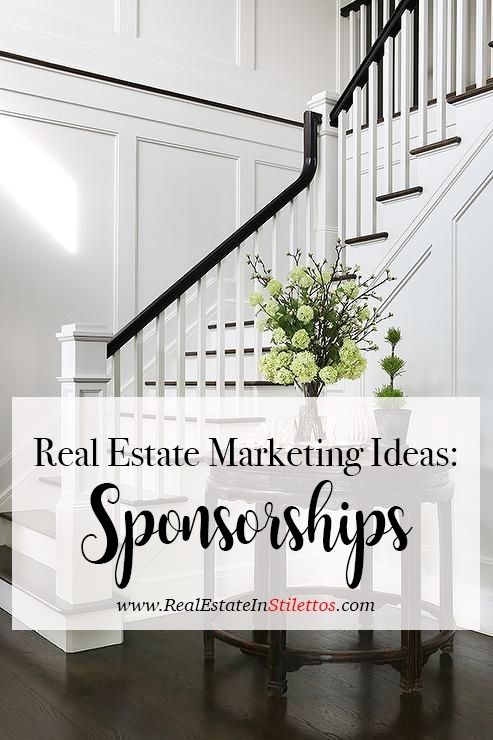 Sponsorship is an effective way of marketing yourself and your time to your community. It allows for maximum exposure without people feeling obligated to speak to you about real estate. Sponsor a local children’s sports team. No better way to give back to the community than watching cute little ones run around in their uniforms. For a lot of families, extracurricular activities can be expensive. Contact your local community centre and see if you can possibly sponsor a child for a sporting event. Participate in a marathon and raise money for cancer research. I don’t know where you live, but in Toronto, there are a substantial amount of marathons during the spring and summer months! Grab a few friends and participate in a run. The money you raise which you can get your clients, colleagues, friends and family to donate, will go towards a great cause. Offer courtesy coffee or sponsor coffee at a farmers market and be the most popular table there. There are so many local farmers markets starting in Spring. Find out how you can have a table there and have complimentary coffee there for the visitors. In addition to the coffee, you can also have market information on properties in the area which have been sold and are currently listed for sale. This will entice visitors to possibly request a home market evaluation. Host a BBQ or picnic. If you live in a condo, it is the perfect place to generate some leads and network yourself. The rooftop BBQ area is a community area for residents. Host a BBQ one summer afternoon or evening and invite residents in the building to come up and enjoy some free food! It`s a great way of building connections in the building you reside. You can even host a BBQ if you live in a house, just send out an invitation to the neighbours inviting them to your home one afternoon for a BBQ! Advertise your business at a local golf tournament. Sponsor a hole or have a table set up at a local golf tournament. You can offer hot dogs and hamburgers or cold drinks to golfers throughout the day. Find what works best for your local gold club and see how you can be a part of the tournaments. Support a local beach or park cleanup drive. There is always an opportunity to give back to the community. Use it to your advantage to get a group together to clean a local park or a local beach. Have large garbage bags, gloves and vests on hand that you can have a local cleaning group sponsor. Partner up with a community centre and get involved in making your community a cleaner place. There are so many ways you can give back to your community. You don`t have to spend an obscene amount of money in advertising in order to obtain clients. I always say that the best resources you can use are the ones that are right in front of your eyes. Be unique in what you do and do it very well. Brand your name as much as you can and make a name for yourself. Real estate is, however, a lifelong career.